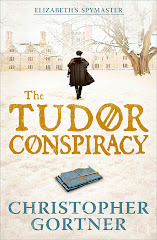 Nowadays, every author is being asked to have a book trailer. 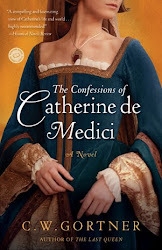 Sometimes the publisher pays for it; more often, the author does. 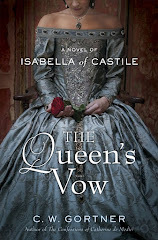 Book trailers are absolute requirements for marketing, we're told, yet to date, no one - not the authors nor the publishers - are quite sure just how effective these audio-visual tools really are. 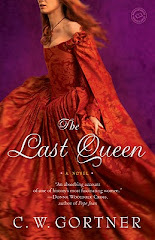 I don't have any new insights to offer (though I do have a fantastic book trailer for THE LAST QUEEN) but I have decided that after so many authors go through so much effort and expense to get these trailers made, the least I can do is share them with my blog readers. 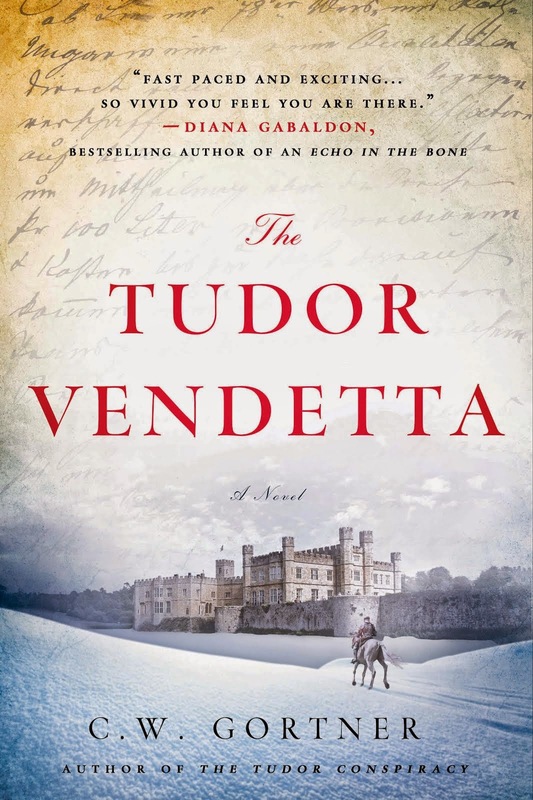 So, I'm going to start a new feature here on Historical Boys called Book Trailer Sunday, in which I'll post my favorite book trailers, hopefully to incite more of us to watch these often marvelously inventive videos, and then go out and get the book! 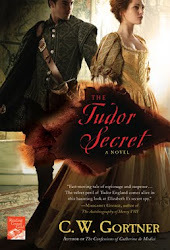 This week, I'm featuring Jeri Westerson's splendid new video for her Crispin Guest Medieval Noir series. Enjoy!! 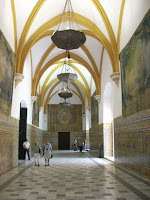 The Alcazares Reales of Sevilla, or the royal palace complex, is one of the hid den treasures of this intoxicating city. 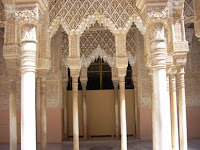 Overshadowed by the internationally renowned splendor of the Alhambra, few people realize before they step foot inside the complex that it is, in fact, a sublime and gorgeously well preserved example of the Moorish architectur al tradition, as well as the Christian one that followed. The photograph to the right shows the entwining of these civilizations in the foundations, as well as columns from the original Roman site. The left shows the medieval fortress entrance; the entire complex is surrounded by walls dating back to the 11th century. 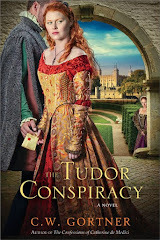 The palace compound began to take shape during the 711 conquest by the Moors, who used the compound as their primary royal residence from 720 onward. 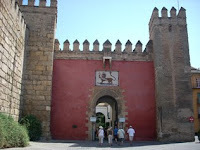 When King Fernando III conquered Sevilla in 1238, it became a Christian palace and fortress. 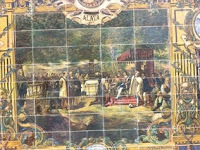 Such famous Spanish kings as Alfonso X the Wise, Pedro the Cruel, and Isabella of Castile all resided in the Royal Alcaza r of Sevilla. The palace was the scene of Charles V's marriage to Isabel of Portugal, and the Infanta Elena, daughter of Spain's current King Juan Carlos I, held her wedding reception here. 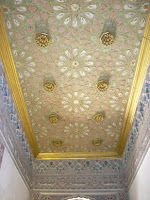 The photo to the left shows the gold-vaulted and embossed ceiling of the grand salon, or hall, where many of the palace's pivotal events took place. The entire palace complex exudes mystique and sensuous echo es of the past; I could well believe that the infamous King Pedro preferred this residence above all others, creating a haven of silk and cinnabar within the royal apartments where he sought to escape the ceasele ss intrigues of his nobility. With splendid gardens, painted ceilings and corridors, festooned with stalacite tracery and cool watery passageways, the Royal Alcazares of Sevilla are a world apart, permeated by a long-gone majesty that reminds us of a time of blood and luxury, iron and alabastar; a time when the fractured kingdoms of Spain created some of the most beautiful buildings ever seen. Taking a day-trip to Sevilla is like taking a day-trip to New York. Sure, you can see a lot, but you'll miss a lot more. 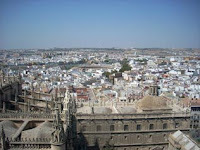 Unfortunately, we only had a day in Sevilla, but it's definitely a city I'll visit again and stay in much longer. Truly breathtaking, Sevilla is worthy of its reputation as one of the great architectural beauties. So much so, I'll be doing two separate posts on the city, of which this the first. I must add that Sevilla's legendary heat was also palpable during our visit; though already late September, the sun fell like an anvil on this gorgeous city steeped in the past, which basks on the banks of the River Guadalquivir. They say that Sevilla simmers but at night it becomes an intoxicating cauldron filled with dama de noche, a fragrant flower vine that grows everywhere on trees in Andalucia and emits its perfume only at night; and, of course, with the scent of oranges. The trees grow in the streets, and while their fruit is sour and unpalatable, the Seville orange's scent is so intense, it was coveted in ancient times for its use in body-oils. 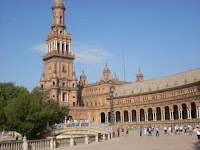 Sevilla has been inhabitated since the 9th century; Carthaginians, Roman s, Visigoths, Moors, and Christians have all at one time called this city home. It was named Hispalis by Julius Cesar; toward the end of the Roman Empire, it was one of the most important cities of Empire and center of Christian activity in the Iberian Peninsula before its conquest by the Moors in 711. The Plaza de Espana in the photo to the right, built in 1929, honors both Spain and the city's incredible historical past with mosaics surrounding an impressive palisade. 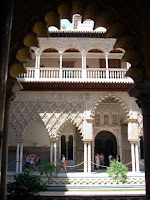 Like most Spanish cities, Sevilla had a rich centuries-long tradition of Jewish livelihood and wealth, which was tragically lost under the reign of the Catholic monarchs. The quarter has greatly changed and now houses some of the most expensive real estate in the city. Still, as you walk through its narrow streets, past brightly painted houses with Moorish-arched windows hidden by celosias (shutters) you can feel the ghostly remnant of a time when different faiths and races thrived in harmony in Spain, creating one of the most splendid and evanescent civilizations the world has ever seen. 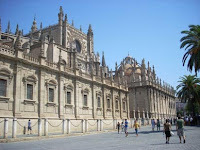 The Cathedral of Sevilla is the largest Gothic cathedral in the world, spanning several blocks and festooned with gargoyles, turrets and buttresses. Built upon t he remains of a central mosque, the Cathedral carries its Islamic foundations within the orangerie outside its gates and decorative brickwork. 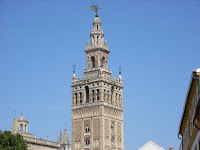 Since 1568, the Cathedral's tower has been crowned by an airy belfry with a bronze weather vane known as El Giraldillo, which has lent its name to the tower La Giralda, known as one of the most famous belltowers in Christendom. 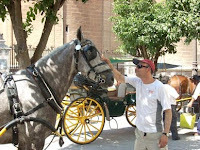 center; and of me with one of Sevilla's most venerable residents: the carriage horse. Once again, I appeal to all of you to help us stand up for wolves in America. 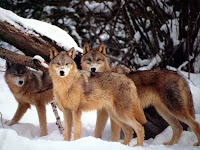 Yellowstone National Park’s famous Cottonwood Pack has just been destroyed - all the adult wolves have been killed and the survivin g pups will likely die without their wolf family. These are just some of the latest victims of the federal government’s likely illegal decision to eliminate vital protections for our wolves in Greater Yellowstone and the northern Rockies. Please sign Defenders of Wildlife's petition and urge Interior Secretary Ken Salazar to immediately take action to restore protections for these amazing animals.The next few weeks will be crucial for wolves in the Greater Yellowstone region. The future of wolves in the northern Rockies is at a crossroads and it will take the voices of caring wildlife supporters to make a difference. 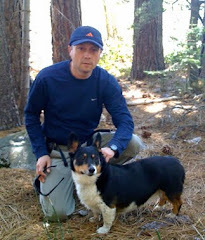 I just signed Defenders' petition to Secretary Salazar and I hope you will, too. Because for me, a world without wolves is a terrible thing to contemplate. Andalucia in southern Spain is one of the most mountainous regions in the Iberian penninsula. 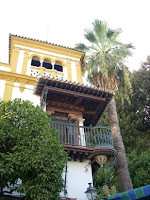 Situated in the mountains of the Sierra Nevada above Malaga lies the jewel-like cit y of Granada, a now thriving modern metropolis that nevertheless reverberates with the echoes of its rich and multicultural past, where once Jews, Moors and Christians lived in harmony, in a paradise of agricultural and societal abundance. 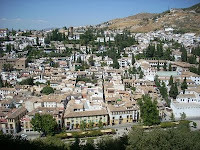 The first picture is of Granada's former Jewish quarter, as seen from the parapets of the Alhambra Palace. 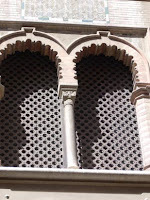 Conquered by Isabe l and Fernando in 1492, Granada fell into Christian hands and Isabel ordered a cathedral built on the site of the Moorish mosque. The cathedral is a marvel of pinnacles and Gothic tracery; in its royal chapel lie the sepulchre of the Catholic soveriegns and of Queen Juana of Castile and her treacherous husband, the Archduke Philip. 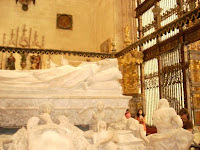 This picture show Juana's sepulchre. The Moors held the city for over 500 years; however, it was not until the last 300 that they began to build the Alhambra. 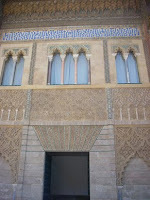 Subsequent generations of Moorish caliphs added to th e palace, amplifying its halls and apartments, and constructing a summer palace for the king and his royal family. 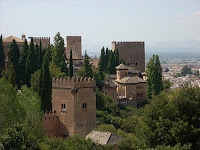 This picture shows the Alhambra as seen from the Nasarid summer palace. The beautiful gardens we see today are from the 16th century; the Moors, with their respect for water, a scarce resource, had orchards and vegetable gardens in the areas where now the modern visitor can bask in sumptuous fountains and greenery. 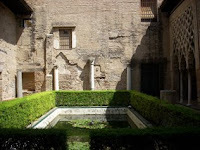 However, the interior patios of the palace, su ch as the famous Patio of the Lions, were adorned with fruit trees and flower pots, designed to imbue the palace with coolness and fragrance in the heat of the summer months. 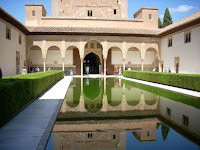 One of the seven wonders of the world, the Alhambra is truly a spectacular testament to the ingenuity, grace and tenacity of the Moors' dominion in Spain. I'm back from Spain and I had a wonderful time! I could have stayed twice as long, despite an abrupt turn in the weather toward the end of the trip and a nasty cold. I thought I'd post a few pictures from my trip in the next few posts and explain a little of the incredible history of Andalucia in southern Spain, where my partner and I spent most of our time. 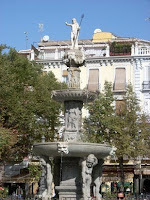 Malaga is an ancient port city, one of the oldest in Spain, where Phoenicians and Moorish civilizations once thrived. 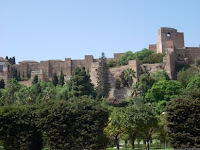 The first photo above is of the Alcazaba, the Moorish palace that overlooks the port of Malaga and was the residence of the rulers of the city for hundreds of years before the Catholic Reconquest. 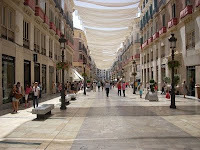 The second photo is of Calle Larios, a thriving shopping street in the center of the city, closed to traffic, that reveals the link between the past and the present. 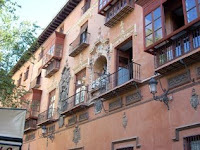 Many of the buildings are 15th to 18th century, their lower stories renovated to accomodate fashionable stores, the upper levels housing some of the most expensive real estate in Malaga. In the third photo, we see the narrow medieval quarter, with a view of the Cathedral spire in the background. 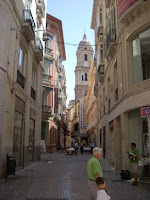 Crowded with local cafes and tapas bars, this area is one of the best to find good, inexpensive food that locals enjoy. 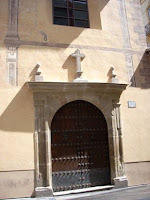 The last picture features the amalgam of cultures prevalent in Malaga: a Moorish doorway, marbled over, in a 16th century church.